A long counter and the cooking area takes up most of the ground floor which has limited seating. There are some small tables here where you can have a good view of the lively cooking action but do note that getting some of the smells and sounds from the kitchen is inevitable. Most of the seating is on the first floor which has room for about 40 pax. We had two starters. 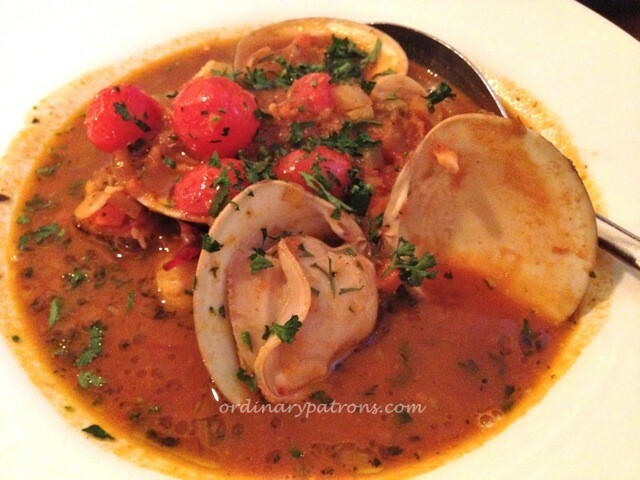 The brodetto di pesce is a tomato-based seafood broth. We understand from Chef Edwin that what goes into this dish may vary, depending on the produce he sources. On that day we were fortunate, as apart from the usual prawns and fish, there were some giant clams. They were very juicy and fresh (as were the rest of the seafood). We would recommend this dish. Our other starter was the fritto misto ($22), which was deep fried assortment of seafood. This is a variation of the usual fried calamari which is often found on Italian menus. The dish reminded us of ebi tempura. By the time we finished the starters we were already quite full and were glad we only ordered one main course to share – the char-grilled ribeye steak ($40). However when the steak arrived, it was much larger than expected, had a good balance of fat and was well cooked with a slight charring finish. The side order of onion and garlic confit ($10) complemented the taste of the steak. All this was nicely paired with a Chateau Calon Segur 2005 which we brought along. We were unable to finish the steak despite our best efforts. Overall, we recommend Oca Grassa for the good food cooked with fresh produce in a slightly different style than a traditional Italian restaurant. One thing we would improve at this place is to provide some soft furnishing to cushion the sound of merrymaking which is amplified by the hard flat surfaces and furniture. #Street fact – Bukit Pasoh Road got its name from Ali Baba jars or basin used in bathrooms to store water. Pasoh, in Malay, means pot, vase, washing basin or jars.